Haul roads are the backbone of every landfill, allowing millions of pounds of waste to be safely and efficiently disposed of. As we see more and more landfills embracing new technologies, haul roads could last longer, keep people safer and make the environment healthier. The waste disposal industry is getting more sophisticated and innovative with each passing year. On the collections side, sensors are now being integrated into containers to automatically trigger pickups, and those pickups are now being made more efficient through route optimization software and robotic arms on trucks. The rates of recycling are also continuing to rise around the world, with rates currently hovering around 30 percent in the U.S. In terms of disposal, landfills are integrating natural gas capturing systems to reduce their CH4 emissions, and many are now adding solar technologies to generate even more clean energy. These improvements and green initiatives must be commended, given the studies that continue to show that climate change is real, and if ignored, will put millions of people around the world at risk. However, despite advancements and innovations helping to protect the environment, there is still so much more that could, and should, be done across the industry. A reclaimer is used to efficiently integrate the polymer at a 5 to 6-inch depth into a newly constructed haul road. Photos courtesy of LANDLOCK® Natural Paving. When hundreds of 30 to 35-ton garbage trucks traverse a gravel haul road, dust is inevitable. Aside from affecting neighboring property owners and communities, landfill workers that have prolonged exposure to fugitive dust can develop serious lung and respiratory problems. Additionally, dust can impair driver visibility and lead to accidents. State and local air quality regulations are in place and to meet them, most landfills run water trucks around the property from sun up to sun down. Some landfills consume as much as 10 million gallons of fresh water every year, which is enough water to cover the annual needs of a small sub-division. This is not a very innovative approach to the problem. The access that landfills have to water varies greatly depending on where the landfill is located—at its best, the water is pulled from a local river and is, therefore “free”, but applying the water costs labor hours, fuel consumption and adds unnecessary mileage to the vehicles. At its worst, in places like the dry, southwest part of the U.S., landfills are using water from the local municipality (at a cost), or they are tapping into local river and/or important aquifers, which should be reserved for times of drought. Making the issue of aquifer depletion and preservation even more complex is the fact that many large aquifers cross international borders, as is the case in Texas, New Mexico, Arizona and California. Climate models are predicting higher and drier conditions in this region, so it is imperative that companies start thinking long term about water conservation across their sites. The erosion that takes place on landfill haul roads generally comes in two forms—water erosion and traffic erosion. Both can lead to significant operational costs and safety issues. Water erosion is virtually inevitable during wet months as the roads see regular rainfall. Ironically enough, water erosion is also often a challenge during dry months due to the constant dust control efforts (when the application of water is the primary method). Channeling, wash-boarding and potholes are the biggest side effects that come from water erosion, resulting in slower delivery times, flat tires and, worse yet, safety issues. Ultimately, regular road maintenance is required in the form of reshaping and re-compacting—another source of costly labor hours and fuel consumption. It is common for landfills to have to import newly quarried aggregate whenever this type of road maintenance is done, which is yet another negative on the environment. Traffic erosion on the other hand is not seasonal, but rather directly correlated to the amount of traffic going in and out of the landfill. Aggregate (and often asphalt millings) that has been laid and compacted into the haul road is slowly pulverized into smaller and smaller particles. As they get smaller, they eventually turn into dust and the cycle starts all over again. Paving these haul roads with asphalt would help tremendously with reducing dust and erosion. However, because most haul roads are only used for a year or two, this approach is cost prohibitive. But what if breakthroughs in materials and technologies could now offer new, more cost-effective ways to achieve a paved surface without asphalt paving? Advanced polymeric emulsions—sophisticated and highly engineered binders—are the answer to this all-important issue of road construction and maintenance. The most effective polymeric emulsions are ones that are manufactured to specification, using virgin, prime ingredients, derived from natural gas. This means they are environmentally-friendly and not petroleum-based, like asphalt. These emulsions have been designed specifically to bind native soils and aggregates and are relatively easy to use in the road construction process when using the right equipment. Independent lab testing has proven that when treating a high-quality road base aggregate, high grade polymers can increase the compressive strength of this material by three to four times. This means that they can be used not only as a solution for dust and erosion control on temporary haul roads, but also for permanent roads, as a way to reduce the overall profile of design. This allows builders to reduce the amount of required aggregate and/or asphalt (and all the associated transportation costs), without sacrificing performance. In many cases, the design and load-bearing capacity will be higher. However, there are many polymer-based products on the market that are nothing more than waste-stream by-products of other manufacturing processes. These have proven far less successful and have unfortunately made it harder for this general technology to gain traction in the market as quickly as it should. As with anything else, you usually get what you pay for, so inferior products are generally quite cheap and should not be trusted. A topical application of polymer is the final step in the stabilization process. When using polymers to stabilize a haul road, the goal is to create a rock-hard composite that is roughly 5 to 6 inches in total depth. 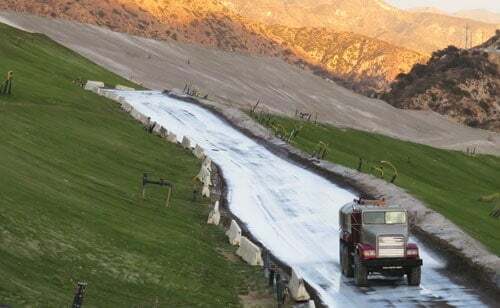 Any company that tells you to spray their polymers on top of the road and let it dry, are selling you short-term dust control, not a long-term stabilization solution. To install polymers properly, and for a long-term result, a reclaimer should be used, which allows the polymers to be blended into the aggregate at a specified depth and application rate. 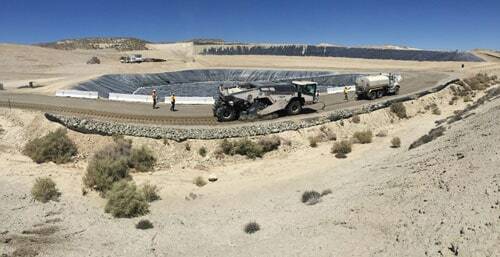 Once the polymers have been mixed in (and take to the point of OMC), the road is then graded and compacted. Top tier companies have developed complementary polymers that have water resistance and UV protection properties that are applied to the compacted surface, adding further strength and structure. If you think about polymers as sophisticated glues, it makes sense that there would be a period of time in which the glue is drying and hardening. Therefore, it is imperative that the road is left untouched for 24 to 72 hours after the installation process is completed. The length of this curing period will depend on local weather conditions—the hotter and drier it is, the quicker the polymers will harden, and the shorter the curing period will be. As with any surface, including asphalt and concrete, there are many factors that will play into its life span, including traffic count, payloads, weather conditions, and maintenance schedules. Unlike traditional, unstabilized haul roads, operations managers should not unnecessarily water these polymer-stabilized surfaces, which can expedite their degradation. Instead, a monthly sweep of the surface is recommended. This will remove any loose material that if left to linger, acts as a source of abrasion, further adding to the long-term deterioration of the surface. Ideally, your maintenance plan should include a topical application of the polymer every two to three years, which is a marginal, short-term expense that will pay major long-term dividends. It is my hope that we will see more and more landfills embracing new technologies that aim to make haul roads that last longer, keep people safer, and make the environment healthier. Industry leaders must be at the forefront of educating the market on the benefits of these technologies and, ultimately, driving the change in mentality required for long-term sustainability in the waste disposal industry. Patrick Bremer is Vice President of Business Development for LANDLOCK® Natural Paving, Inc. and explores the current issues in the waste disposal industry and the innovative developments required for long-term sustainability. LANDLOCK is a global leader in the development of Smarter Infrastructure. LANDLOCK’s proprietary, polymeric emulsions reduce the waste of time, money and the environment commonly associated with traditional construction. Patrick can be reached at patrick@landlocknaturalpaving.com or visit www.landlocknaturalpaving.com.